It was on a damp and windy Saturday afternoon at home at Chaffers Field that league leaders Old Otliensians defended their unbeaten record against an in-form Wetherby side pushing for second place. 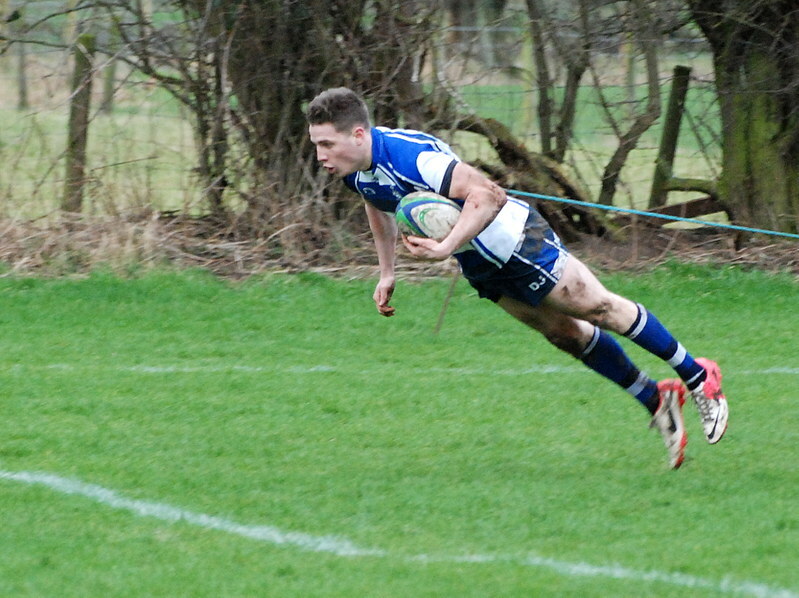 Wetherby were quick out of the blocks and keen to apply pressure on the home side. However the early exchanges were scrappy due to the conditions with handling errors from both sides. The home front row of Ross Nichols, Jim Dyson and Ross Myers was under pressure from a larger Wetherby front row and Number 8 O'Donnell did well to collect going backwards. On 5 minutes after some good drives forward by locks Jack Smith and Ali Cambell, 'Ensians released the back line and Wetherby were penalised for a high tackle. Full back Kristian Keinhorst slotted it over giving the home side a 3-0 lead. There was then a sustained period of pressure from the visitors, but as always the home defence was not easily broken down, with some big tackles from flankers Sam Featherstone and Ollie Cooper and centres Nathan Rogers and Luke Cowdell. Lock Smith made a crucial turnover to regain the home side possession. 'Ensians then played the phases up field with solid drives in the forwards from Smith, Nichols, Campbell and Featherstone and good handling from scrum half Rob Lofthouse, stand off Luke Freer and Keinhorst, giving winger Joe Hatton and centres Rogers and Cowdell chance to make good ground, despite the conditions. This sucked in the visitors defence to then release the dangerous back line, leading to winger Declan Jackson galloping in for a try wide out. The conversion was missed giving the home side an 8 nil lead on 30 minutes. A handling error after the restart led to the visitors regaining possession and working their way towards the home try line through their powerful forwards. 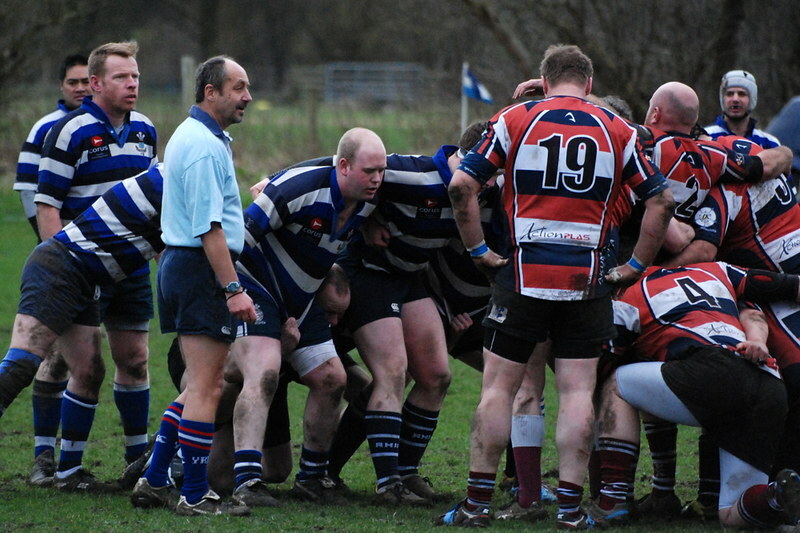 On 35 minutes the home side was penalised and Wetherby opted to scrum. The initial defence was excellent, however the pressure on the line was too much and the visitors scored out wide. The conversion was missed bringing the score to 8-5. After the restart the home side put good pressure on the visitors, keeping them pinned in there own half, on 39 minutes lock Smith was shown a yellow card for late and side entry into the ruck and so the home side went into the break with a narrow lead but a man down. From the kick off Number 8 O'Donnell made a fantastic break up field into the visitors 22 but when trying to release the back line there was a handling error and the visitors cleared down field, using the wind well. A scrappy lineout led to the visitors regaining possession in the home 22. Their stand off put in a good cross field kick which the winger ran on to and into the corner. However he was well in front of the kicker and the try was not allowed. An infringement by the home side on the 10 metre line led to a Wetherby penalty which was converted to level the score on 52 minutes. After the restart the visitors worked there way into the home 22. The home side's defence, as always was very hard to break down. On 60 minutes prop Nichols went for an interception but knocked on. The referee determined this was deliberate and showed him a yellow card. Wetherby kicked the resulting penalty and took the lead 8-11. This spurred the home side into action and after the restart the intensity of the defence and attack was higher. A turnover on the ten metre line led to some great play upfield by centres Rogers and Cowdell, with strong running from wingers Jackson and Josh Howarth, who was on for Hatton. Unfortunately the last pass didn't quite go to hand allowing the visitors to clear and the home side had to start again. The introduction of veteran prop Pete Bonner (on due to Nichols' yellow) helped to solid up the home scrum giving them a better platform to work off. The visitors back line were penalised for being off side and Keinhorst stepped up to level the score to 11 all on 68 minutes. The home side kept up the pressure on the visitors with some good drives upfield by O'Donnell, Cowdell and Howarth getting the home side into the visitors 22. Again the Wetherby crept offside in an attempt to suppress the home backs. Again Keinhorst stepped up and put the home side back in front 14-11 on 72 minutes. The latter part of the game was back and forth with the visitors never getting into the home 22 and the home side just unable to get that last pass to hand in order to score again. The game finished 14-11. This was a hard fought victory for the home side which took a lot of hard work by all involved. Credit has to go to Wetherby who came to win and pushed the home side up to the last minute.